The Civilization franchise has found much success since the 90’s, when Sid Meier’s original Civilization game was released. These games let you choose a civilization (such as America or Rome) and take it all the way to the Space Age. Starting in the Stone Age, you get to build cities, roads, engage in diplomacy and war, and research new technologies in order to gain an advantage over your neighbours. Each Civilization instalment has also featured a colourful leader behind each civilization (civ for short), whom you could interact with in a diplomacy screen. These guys did not always behave as their historical counterparts did (many people raised an eyebrow after they were nuked by Ghandi in the first Civilization game, for instance…), but have always been fun to play against all the same. And like the earlier games, Civilization VI features a nicely animated, charismatic leader for each civ. For instance, Rome is led by Emperor Trajan in the game, while John Curtin is behind Civilization VI’s Australia civ. 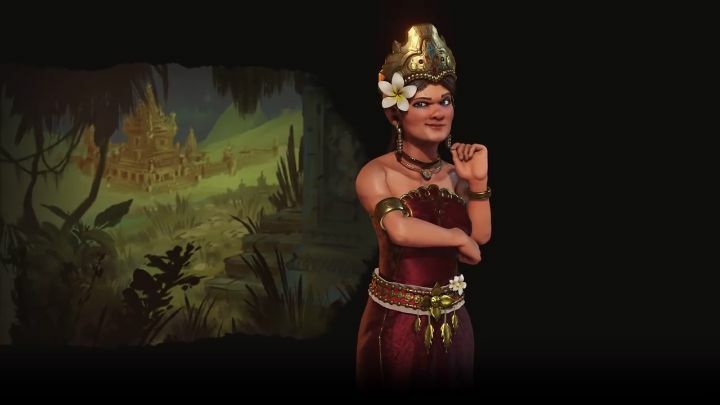 And now the game’s upcoming Indonesia civ, which is led by Dyah Gitarja, has been revealed in Firaxis latest preview video for the game. Gitarja was a 14th century Indonesian queen, who ruled over an empire back in the day, even managing to increase her holdings during her almost 20 year reign. Also, the fact that real-world Indonesia is an island nation is reflected in the game, as this civ gets the “Great Nusantara” special ability, by which certain districts such as Holy Sites and Industrial Zones get bonuses when built on coastal tiles. Also, it will be an easier task to develop coastal tiles when playing as Indonesia thanks to their unique improvement, the “Kampung”. This improvement will grant additional production and food for each fishing boat located in an adjacent tile. All in all, it’s clear that Indonesia’s advantages in the game come into force when playing on island maps. Actually, this civ’s special unit is a frigate replacement known as the “Jong”. This is faster than the frigate other civilizations get, plus it gains some nice bonuses when it’s in a formation, such as extra combat power, meaning taking over the seas when playing as Indonesia could become one of your in-game goals. This will also be made easier by the fact that it’s possible to purchase naval units at a discount using faith too, helping build a powerful navy quicker than other civs can. It looks like Civilization VI’s upcoming Indonesian civ will be fun to play for newcomers and veterans alike, then. This also could be an interesting addition to the game, especially for those who like to settle coastal areas and take over the seas in the game, and perhaps a good alternative to playing as other sea-faring civs like Norway. And hopefully developer Firaxis will keep adding new content to Civilization VI, improving what already is one of the best strategy games released in the last couple of years.